In March I received an email from my old University (The University of York) out of the blue asking if I would be willing to accept a nomination for the Duke of York Young Entrepreneur Award. I was really surprised to be chosen, especially as I was now a graduate! The ceremony itself was in Huddersfield and was really exciting: His Royal Highness took an incredible interest in the businesses of all the winners and it was great to hear what others were up to. 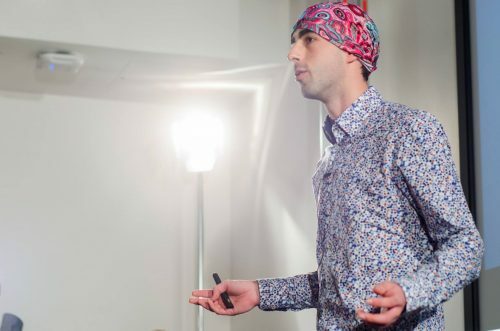 Since I was in the Yorkshire area, I took the opportunity to visit my old University and meet with some of the Entrepreneurs currently working with the Enterprise Department which was great fun. 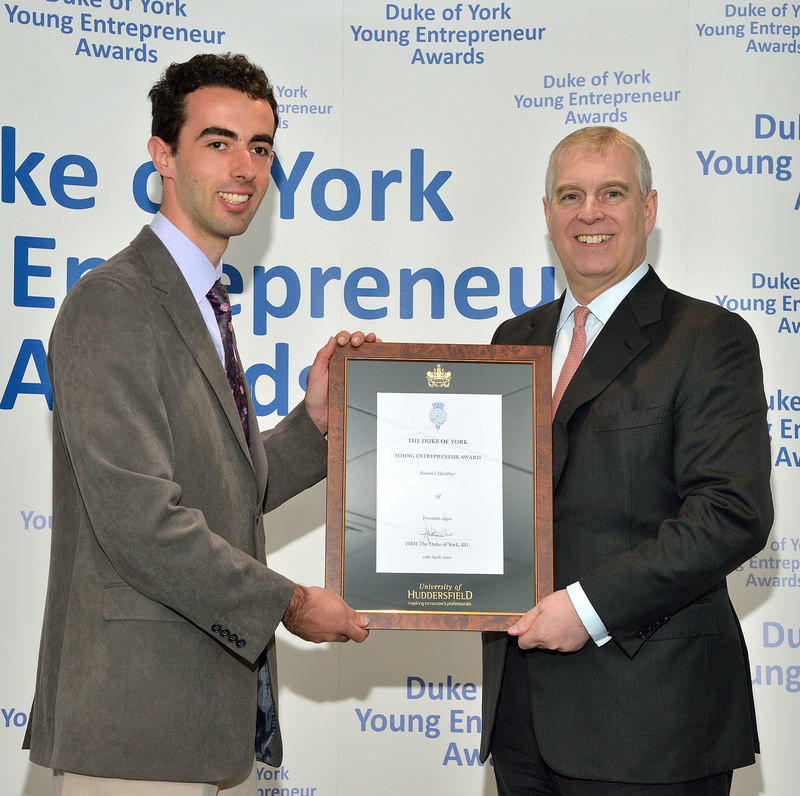 This entry was posted in Entrepreneurship and tagged award, duke, entrepreneur, huddersfield, of, york, young on April 21, 2016 by Sam. Following on from my work in Sudan last year, yesterday I was given the opportunity to hold a workshop for the three winners of the Mashrouy programme; Houida, Abrar and Maha. 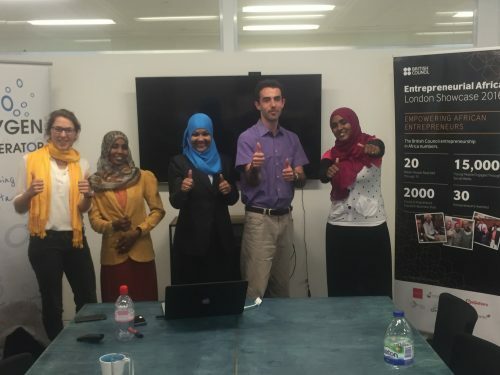 The three were over as part of the 2-week long trip that winners of the Mashrouy programme receive, which as well as a tour of the UK, includes workshops on business practice. Once again I was struck by the innovativeness of the businesses and how different they were to those in England. The businesses are, from left to right: production of an organic tick-repellant to reduce illness in cattle from local natural resources; software for analysing mammograms with lower cost and higher accuracy; and a substance for tanning leather extracted naturally from tree bark, reducing use of imported chrome and the environmental impact of chrome. Speaking about any aspect of business when the markets are so different is tough. I was asked to speak about tracking business progress using KPIs and OKRs (a topic we went into great detail on during Techstars) and then on how to utilise mentors. All candidates in Mashrouy work with mentors, but getting the most out of a mentor is a process that requires some planning. We discussed how to write short, punctual emails with clear and concise points and ‘asks’, and the best way to ask for an introduction to somebody that your mentor knows (with the help of a post by Russell Buckley). This entry was posted in Entrepreneurship and tagged accelerator, Mashrouy, oxygen, Sudan on April 14, 2016 by Sam. Our compiler is open-source, you can get the code here on GitHub. It’s been a little while since I’ve blogged about the UniCPU team project – which could be perceived as meaning that we’ve dropped the project. Don’t worry, we haven’t! Since my last post, we’ve (we = Andrei) continued to make progress on the hardware. Most of the recent work is just wiring up the various units to the multiplexer and wiring up the ROM, all of which is very simple and time consuming. Certainly not worthy of a video. Whilst Andrei was making progress on the hardware, I got started on writing the compiler (don’t worry, if you don’t know what an compiler is, it’s explained below) for the instruction set we’re supporting. This came at a really timely moment, since I’d just finished studying a module on compilers at University (SYAC, at York), so I had the chance to put the theory into practise – but in a simplified form (since, in my view at-least, there’s no point wasting 10’s of hours writing a super flexible compiler when a simple one will do more than we need). Before we get into a discussion on the actual compiler, there’s an important question: what is a compiler? Put simply, a compiler is a program that transforms code written in one language to code in another language. It’s typically the thing that transforms code in a high-level language (for example, Java or C) to machine code (a language that can be understood by the CPU in your computer). ADD 5 // Add 5 to the value in the accumulator. ( // Represents comments. Anything following “//” is ignored by the compiler until the line end). If you remember from our earlier posts, everything within our CPU is represented as single bytes (i.e. 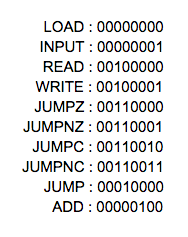 an instruction is 8 bits, all operands/values are 8 bits). This means that our instruction memory is always expecting to receive two bytes per instruction – one for opcode and one for the operand – which will be nulled to 00000000 if the opcode doesn’t require a parameter (for example, INPUT). This means we need to have a binary representation for each opcode – which we have. A truncated representation of this is displayed on the right, but you can view the full logic behind this in a spreadsheet located here. So, first we put the opcode for INPUT in, then the null operand (since it doesn’t need a parameter). Then we put the opcode in for ADD, followed by the binary representation of the parameter (5 = 0b101). Giving us the above block of binary. Another feature of most programming language is the ability to jump from one section of code to another without having to use line numbers. This is because using line numbers is incredibly difficult to maintain – say your application jumps back to line 17 regularly, and then you add an extra instruction before line 17, you have to change every reference to line 17 to line 18 – a massive waste of programmer time). In the UniCPU language, this is implemented using labels. You insert a label in your code, and then you can jump to wherever that label is defined. In the below program, the path of execution is lines 1,2,3,4, followed by getting stuck in a loop through lines 2,3,4 for ever, constantly adding 8 to the accumulator. The important question is: how do you write an application capable of doing this – turning one code in one language into code written in another language, and support things like jumps? First you need to select a language to write your compiler language in – independent of the language you are compiling from/to. Because a large part of compilation is string manipulation (i.e. looking at input text, splitting it into tokens, looking strings up in dictionaries etc) we need a language that makes string manipulation simple. Our compiler is quite simple (it’s simple as compilers go anyway) so I selected Python. It’s not the most efficient language, nor is it the language with the most explicit syntax – but it does make splitting Strings easy. Of course, the first step is to do your initial setup for your compiler. In the UniCPU compiler, this involves initialising the compilerDictionary with the binary for each instruction, some helper lists for categories of Opcodes and the dictionary which will hold line numbers of code labels. We then call setupAndStart(), where we load in the input code and split it into a list of Strings, where each String is a line of code. Here, we check if a line is empty after removing any comments (which is checked by checking if, after splitting the string by the comment symbol “//”, there is any text in the first block returned from the split call). If there is, there is code on that line and it’s not blank. Otherwise, it is blank or only had comments on it so we delete the line from lines. It’s important to remove blank lines before working on labels/jumping/looping as this is dependent on line numbers within the code, and by removing lines we change the line number of some lines. During compilation, we keep a list of 2-item lists – each 2-item list represents a line of code with two operands. This is because, in this compiler, there are two main stages to compilation, both of which need access to individual tokens (a token is just a representation of 1 byte, whether an instruction opcode or an operand/value) – these are compiling (converting the human-friendly opcodes to binary and converting the base-10 numbers to binary) and linking (replacing labels in JUMP commands (used for looping and iterating) with the final line numbers). At the end of the process, that dictionary is all concatenated into one long binary string – the program. The compilation stage is really quite simple – in Stage 0 above, I talked about setting up a dictionary mapping instructions onto the binary we defined for them in the hardware. In the compileLine(inputLine, lineNumber) function, we first check the line for whether it contains one token or two. Ignoring LABELs for a moment, we then look at each token separately. The first token is passed to the compileInstruction(instruction, lineNumber) function where we simply look up the token from the compilerDictionary defined at the top of the programme to obtain the binary representation of that opcode. The second token (if there is one) will be the operand for the opcode that we just compiled. We want to convert the operand (a number) to binary, so we pass it to the function compileValue(value, lineNumber) which returns a String of binary digits representing the base-10 number that was input. In the event that there was no operand (there was only one token, a ‘standalone opcode’, such as ‘INPUT’, ‘SHIFTL’) we set the second token to just be 00000000 (a null byte because the value will not be used). In a separate pass, finding all of the compiled JUMP instructions and then compiling the operands (the LABELs) using the labels dictionary. Locating and listing all of the LABELs is done during the initial compileLine step in Stage 2. When a LABEL Opcode is found, a record is added to the ‘labels’ dictionary, using the LABEL name as the key. The value for that key is the line number that will be executed when a jump to that label is called, minus the length of the ‘labels’ dictionary. This subtract is made because lines containing a LABEL will be removed (by not being added to the list of compiled lines ‘compiled’), because they don’t actually cause the CPU to execute anything (they’re just a short-cut for the programmer that the compiler than expands). print "ERROR: LABEL: ", compiled[lineNumber], " is never defined." In the above code example, we are checking each line of code in the list of ‘compiled’ lines to see if it contains a JUMP instruction. If it does, we identify the second item in the 2-item list (the operand) and look it up in the ‘labels’ dictionary (the dictionary containing all the LABELs and the corresponding line number they should point to). We then convert convert the base-10 integer to binary and return the compiled line. Finally – the ‘compiled’ list now contains the whole programme, compiled to binary. We just have to convert each 8-character string of binary characters to a byte, concatenate them together and then write them out as a binary file and it’s ready to go onto the CPU! The easiest way to do this in Python 2.7 is using the chr(int) function. The chr(int) function takes an integer as a parameter and returns a character according to the ASCII scheme. Since the ASCII system stores characters in 8 bits (the same as our CPU), outputting the characters into a binary ASCII file is all we have to do – that file can then be written to the memory of our CPU, and voila! The CPU will execute our code. In the above code, we first initialise an empty string which will contain our output data (the compiled code). While there are still bytes to be compiled (that the length of compiledCode is still greater than 0), we isolate the next byte, convert it to an Integer, and then convert it to a binary ASCII character using the chr function. We then append that to the outputData, and remove the byte (8-bits) we just processed from compiledCode (so that the next byte can be processed). When all the bytes have been compiled, we open a file in write mode and write the data to that file. Our compiler also has the ability to output ‘human-readable’ code, i.e. code that is separated by line and includes a space in-between the opcodes and operands. This is controlled by toggling a boolean, and makes debugging much easier. That’s it! A long post, but hopefully it was an interesting read! This entry was posted in Computer Science, CPU Project, programming on December 5, 2015 by Sam.